Historical assessments of Catherine the Great have not been kind. She was, indeed, a complex and contradictory personality. Inspired by Enlightenment ideals, she was nevertheless threatened by their actualization in the French Revolution. Given the choice between liberal ideals and the preservation of royal and aristocratic privilege, she chose the latter. German-born, she became a grand duchess upon her marriage to the future Peter III, heir to the imperial throne of Russia. 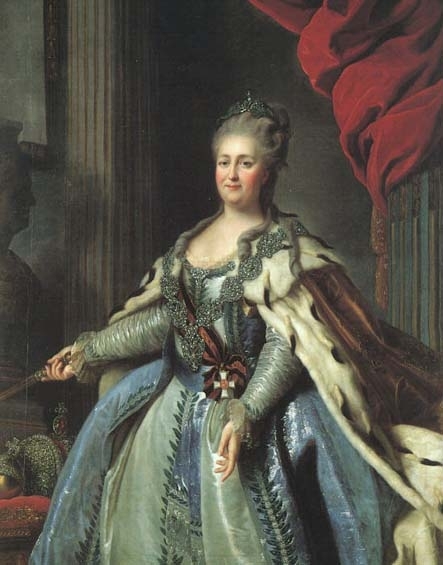 She endured eighteen miserable years with an unbalanced husband before becoming empress of Russia in 1762 (Peter was assassinated in a revolt). A disciple of liberal philosophers such as Montesquieu and Rousseau, Catherine assumed the throne with a sincere desire to continue the Westernizing, modernizing mission begun by Peter the Great. But many of the elements of her ambitious reform program—an Enlightened constitution, the expansion of education, the abolition of serfdom—were quickly discarded in favor of realpolitik. Serfs and peasants—95 percent of the population—were subjected to more systematic forms of control; their forced labor, in effect, created the revenues needed to finance Catherine’s military exploits and cultural projects. Her achievements, on the other hand, include the building or renovation of dozens of towns; under her brilliant administration, trade and communications expanded with infrastructural improvements. A cultured woman with intellectual aspirations and extravagant tastes, she patronized science, literature, and the arts, and engaged in extensive correspondence with the great minds of her time, such as Diderot and Voltaire.